← TODAY’S STACK AND SHOULDERS TOO! I had a late, protein dense lunch. I also had a great amount of protein and carbs for breakfast and my midday snack. 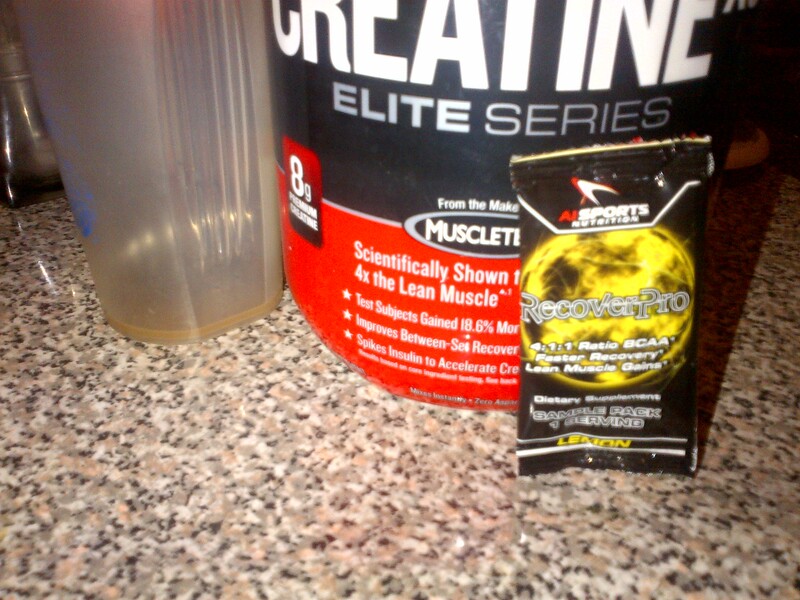 3/4ths of a serving of Six Star Creatine by Muscletech- 6 grams give or take. One prepackaged serving from the good folks at Ai sports of their RecoverPro supplement. It has a 4:1:1 ratio of BCAAs. Both of these brands are earning both my trust and respect. Anything Muscletech seems to be the favorite of every #gymrat I know personally. Seriously. And I like their brands but that’s neither here nor there. Ai Sports was generous enough to send me a supplement sample pack early on and then an additional pack later. I even got a pretty nifty tee shirt. Both companies have pretty good tasting products and vastly soluble ones as well. Together they didn’t mix so well initially lol. I fixed that with a BlenderBall and a massive shaking. I figure this is a simple way to ease in. I’m doing leg presses and leg curls in both directions. And probably leg abductions (great for inner thigh muscles). So legs are focused motion and lean supps. Like I always preach- Need Fuel In That Tank! This entry was posted in Supplements, Supplements and tagged #getbrolic, AI Sports, BCAAs, creatine, gainz, growth, gymrat, muscletech, nutrition, RecoverPro, six star, supplelements, todays stack. Bookmark the permalink.